It's review time, obviously! Check out our review after the break. 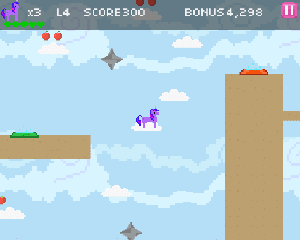 At it's core Adventure Ponies is a rather simplistic platformer. You start out with Twilight Sparkle as your character and unlock the other ponies with their own abilities (well, except for Rarity: she's a Twilight clone). Twilight and Rarity can both teleport when standing on special bases and fire magic projectiles, Applejack can climb ladders and use a powerful buck attack, Pinkie Pie can also use ladders and fire exploding balloons from her party cannon, and Rainbow Dash can fly and use a ramming attack. Meanwhile Fluttershy is ridiculously overpowered as she can both fly and use a hard-hitting stare attack that will have any boss begging for mercy (and make brick walls crumble to the ground). The game features six levels, although you will find that the levels undergo slight modifications depending on which pony you play as. Scattered around the level are apples that you can collect to increase your score, hearts to replenish health, and extra lives. There is also a timer for each stage that will give you bonus points when you beat the clock, and at the level's end a boss shall be found. Overall it's pretty standard stuff, but the old formula has withstood the test of time and remains fun as ever. I must say that the 8-bit graphics are quite well done and have a nice, retro feel. It actually feels like a game that one would play on an Nintendo Entertainment System or another older console, a feel that most of our 8-bit fangames lack except for Story of the Blanks. Come to think of it several boss levels use a parallax scrolling effect in the background which looks pretty but probably would have been impossible for a NES to handle. This is not a bad thing (especially when you consider my infamous love for that visual effect), but it might end up offending some ultra-sensitive retro games out there. As for the music...it's just there. Not particularly memorable music I might add, but at least it doesn't get annoying after being played over and over for most stages. The game sounds pretty good so far, eh? It is, but sadly there are a couple issues that detract from the overall experience. First off, jumping feels somewhat off, making precise landings difficult, and for some strange reason the clouds are slippery! Even if you land on a cloud (which can be fairly difficult in itself) you might slide right off and fall to your death, and since the game has no savepoints you'll have to start the level all over again. Eventually one gets used to the weird controls, but for your first couple playthroughs you'll feel a strong urge to ragequit (thankfully it's not quite as frustrating as Crazy Pony). 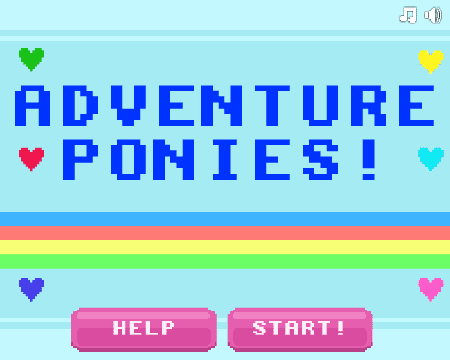 In conclusion we must say that Adventure Ponies is a great game. 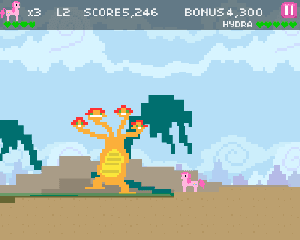 The 8-bit style looks fantastic, the gameplay is fun, it has bosses, it's official, etc etc. If it weren't for the maddening controls and those slippery clouds I would have had no complaints about this game, but since these get in the way of the fun I'm going to have to give this game a 7/10. Sorry Hasbro! ...What? It's not like 7/10 is a low score, right?